Inuit Pay or Intuit Pay is a merchant service solution offered through QuickBooks by Intuit. The service was formerly a standalone subscription, but is now part of the larger umbrella of QuickBooks services. Intuit Pay includes a small range of offerings including bank transfer via direct debit, invoicing, payrolling, and more. What Happened to Inuit Pay? What is Intuit and QuickBooks? Unfortunately, QuickBooks no longer offers credit card processing or virtual terminal services in the United Kingdom. Instead, you can access a variety of payment options including online invoicing and direct debit through QuickBooks and integrated apps. If you’re wondering if Intuit still has a solution for you, keep reading to learn more about what QuickBooks has to offer, their transaction rates, and reputation. Intuit Pay was launched in the UK in 2013 following a 2012 introduction of Intuit Go Payments with a card reader. However, both services were discontinued in the UK in 2015. 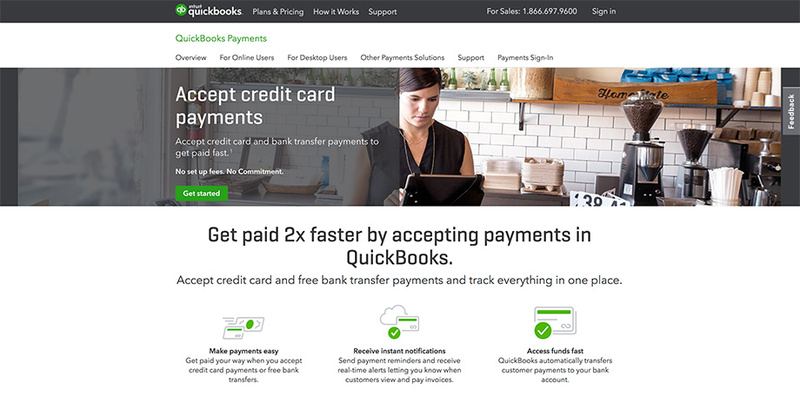 QuickBooks integrated both under QuickBooks Payments, dropped their UK card reader, and switched to offering primarily online bill pay. This means that Intuit no longer offers a true merchant service solution in the UK and no card processing. However, US users can access card payments and ACA bank transfer alongside other QuickBooks features under QuickBooks GoCardless. If Intuit offers QuickBooks GoPayments in the UK, their rates would likely mirror these, but possibly with a pence-per-transaction rate based on the conversion rate. In 2017, Intuit launched a trial program to determine if their U.S. payment services work in the U.K, but there is not yet enough information to determine if they will eventually launch a comparative card processing service. QuickBooks is a full-service account SaaS program offered by Intuit, the leading accounting and financial company behind programs including TurboTax, QuickBooks, PayCycle, Mint, and formerly Quicken. The company was founded in 1983, making it one of the oldest software-based payment solution providers. QuickBooks is primarily an accounting program, offering bookkeeping and automation for small business and freelancers, with invoicing, direct debit, and some payroll features. This makes it easy for small businesses to manage finance and books without investing in a full-time accountant or bookkeeper, and with payment features, enables you to accept payments online. However, with no credit or debit card processing, QuickBooks is not a solution if you have a brick and mortar business or want to accept credit or debit cards on your website. QuickBooks offers three service plans in the UK and then direct debit and PayPal features are available separately through third-party resources. Each of these offerings supports both PayPal and GoCardless, which are QuickBooks’ recommended solutions to Direct Debit and online payments. QuickBooks offers a number of merchant services aimed at small business, online retailers and e-commerce sellers, and contractors or freelancers. Invoicing is an integrated solution offered as part of any QuickBooks subscription. The service enables you to accept bank payments and PayPal payments directly from an invoice. You simply enable online payment, choose accepted Payment methods, and customers can pay by clicking a button on the invoice. QuickBooks also offers real time notifications and automatically updates your books, making accounting simpler. QuickBooks integrates with GoCardless in the UK to offer direct debit services to customers in and around the UK. While not part of QuickBooks, the app is setup to integrate seamlessly, and all payments will automatically update in your books, just like accepting through QuickBooks. GoCardless has a very simple pricing scheme with a minimum transaction fee of 20p, 1% of any transaction over, and a max transaction fee of £2. QuickBooks integrates with the PayPal for QuickBooks app to offer e-commerce and online Bill-Pay solutions. This enables you to source both online payments and merchant services with card payment through PayPal and integrate it directly into QuickBooks. QuickBooks makes it easy to generate and mail physical or digital payslips to employees. Pay slips are generated automatically based on payroll and employees, which can also save time and prevent errors. While QuickBooks does not offer full card payment processing in the UK like in the U.S. and Canada, you can integrate with dozens of apps and merchant services that do. QuickBooks offers hundreds of apps for direct integration, so you can add shopping carts, merchant services, and other payment solutions. QuickBooks offers a variety of customer service including live chat, a help forum, and telephone support. While help isn’t always expedient (you may have to wait up to 30 minutes if you contact via social media), customer service is generally friendly and helpful, with a full knowledge of the software and its offerings. However, there is some inconsistency, as not all Intuit customer service representatives have the same level of knowledge. Overall, customer service and support is very good, and you likely will not have any problems getting the help you need. QuickBooks, and Intuit as a whole, has a very good reputation with primarily positive reviews, even on sites like TrustPilot. However, about 25% of total reviews have negative points, largely surrounding the fact that software sometimes has bugs or speed issues and QuickBooks cloud software can be very slow with slow Internet. There are virtually no complaints about pricing, product delivery, hidden costs or fees, or other common complaints seen with most merchant services. While QuickBooks has a lot to offer for many, it is not a merchant account service and likely not what you are looking for if you were searching for Inuit or Intuit Pay. However, there are numerous small business payment solutions you can consider. PayPal is one of the largest payment institutions in the world, accepting payments for more than 17 million merchants. The service includes card machines, virtual terminal, invoicing, and online bill pay with rates starting from 3.4% + 20p – 2.75% + 20p for most customers. Payzone is a UK-based (Dublin) merchant service provider with annual transactions in excess of £1.2 billion per year. The company primarily offers full-service online payments with third-party merchant services through top merchant account providers like Barclaycard. While Payzone does not offer upfront transaction pricing, the company does offer a range of card machines, 12-month contracts, and no setup or early termination fees. Sage Pay is small-business payment solution provider offering card processing, virtual terminals, card machines, and online invoicing. Sage Pay was created by an online software company and offers very similar features and services to the now defunct Intuit Pay. The card processing solution also offers flat rate fees for most transactions, with 1.99% for Visa and MasterCard, 40p for debit card, and 2.2-0.59% for e-invoicing. HandePay is a UK-based card-processing company offering merchant accounts, card machines, and virtual terminals. While the company does not offer upfront pricing, it does offer card machines at lower rates than most competitors, alongside a low monthly fee starting from £9.99 per month. It’s not always easy to determine which payment solution is the best for your needs based on services alone. Therefore, you are recommended to request quotes and review what’s included for the money wherever possible. In most cases, the best payment solution for your needs depends on how you want to accept payments, transaction volume, and how you negotiate with each company. QuickBooks has a lot to offer but with UK services stripped down since Intuit Pay’s retirement, it’s not an ideal payment solution. Small business owners, contractors, and freelancers can benefit from direct debit, PayPal, and invoicing, but most businesses will sorely miss the ability to process and accept credit cards. However, with a full suite of accounting and bookkeeping tools available, QuickBooks is still one of the most frequently used small business tools on the market. Therefore, you may be able to benefit from QuickBooks in combination with a traditional merchant account service from another provider, giving you access to both card processing and online invoicing with direct debt. If you already have an accounting or bookkeeping tool or prefer to use another solution, QuickBooks will offer little value over competitors or over sourcing a single payment solution offering both direct debit and card processing. Overall, it’s a best fit for micro businesses and startups with minimal payment needs and no card transactions or an existing merchant account service. While Intuit Pay is gone, QuickBooks still has a lot to offer for nearly any small business. The company offers quality customer service, a range of support services, and low transaction fees making it ideal for startups and any small business in need of online payments. However, with no debit and credit card processing, and direct debit processed through a third-party app, you will find that Intuit’s new payment solution is more than slightly inconvenient when compared to Intuit Pay. For example, you will have to use a third-party app for any integrated payment including PayPal and direct debit. If you’re looking for an online payment solution, PayPal, Payzone, and SagePay all offer much better and more flexible alternatives. However, if you only intend to use direct debiting and invoice, QuickBooks includes a lot of extras that will help you manage your business and bookkeeping, plus comparatively low transaction rates capped at £2, and an easy reporting tool that will save you time.